of the old Peninsula Boys Club. Behind the Boys Club was a small structure which once was a community center in the 60s. of being in there for some reason ... probably a Boys Club thing. 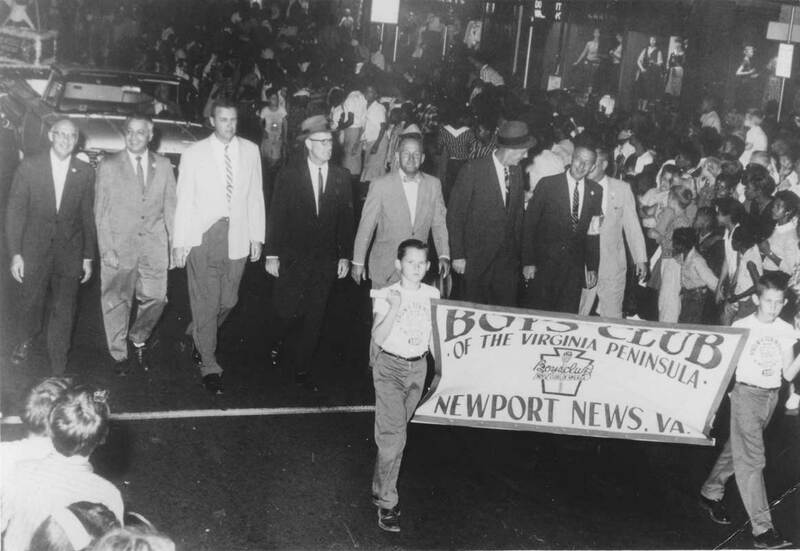 The exterior of the Boys Club of the Virginia Peninsula. Close up of the sign on the exterior of the building. 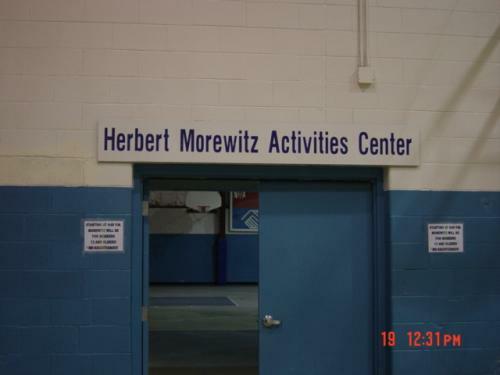 Here is the wing, Gym dedicated to Herbie Morewitz. is in the center; on the right is W. F. "Bill" Files. Here is a photo to stimulate interest among some of the older subscribers. An old photo of the Boys Club that was situated in the 400-Block of 28th Street is being mailed to me by Mickey Marcella ('54) of VA. I will scan it and email it to you when it arrives. When this structure was torn down to make room for the Sears parking lot and renovations on the 28th Street bridge, it moved to Jefferson Avenue and that location is now a church. 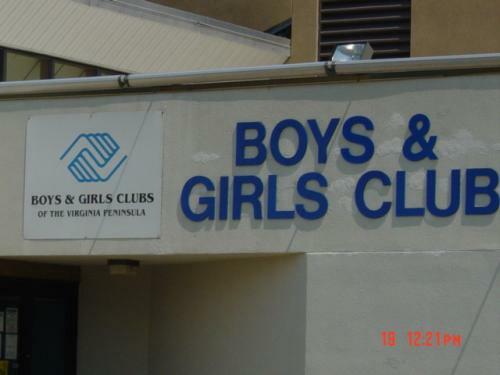 The combined Boys and Girls Club as it is now known is on U.S. Route 60 north of Stoneybrook Shopping Center. Looks like we might have a vintage Old Stomping Grounds in the making. So many of the outstanding basketball players for the TYPHOON got an early start at the game by participating in the programs at the Boys Club. I suppose that is why I am such a pest about this old stomping ground. Thanks, Joe! You're not a pest at all! You're simply dealing with a webmistress who's in a fog right now! Rex and Malcolm Davis ('66 and '65), Ronnie Wood ('65), Tom Oxner ('65), The Dempsey Sisters (Katie - Warwick HS - '64 and Patty - '66), et. al. It also led me to begin visiting the Boys Club at the corner of Jefferson Avenue and Hilton Boulevard. Even when I reached 16, the age at which I was ineligible to attend, the Director, A. T. (Tom) Olaisen, bent the rules and allowed me in. My vivid memories are of shooting pool, watching old B&W cowboy movies ... (yes, they killed Indians and "bad guys", but we didn't return to the Club with an assault weapon and kill everybody there) ... and eating countless numbers of 10-cent boiled hot dogs. volunteer work for charitable organizations. 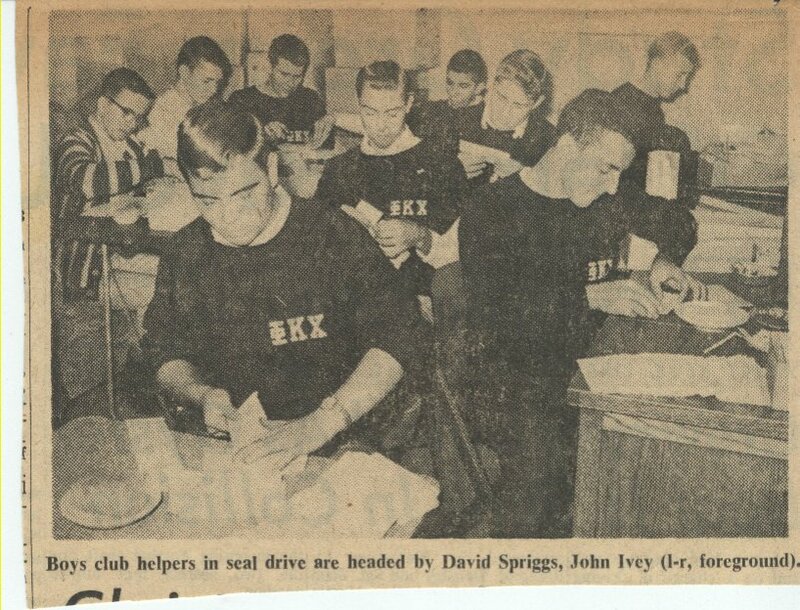 I still have a newspaper clipping showing a photo of several of us licking and stuffing envelopes somewhere. We quickly realized that our organization was abbreviated PKC, which sounded like a fraternity. We also realized that this was about as close as many of us would ever get to a real fraternity, so we all bought cheap black crew neck sweaters and emblazoned "PKC" on them in white Greek letters. Pretty lame, huh? Revenge of the Nerds in 1963.
and no girls. My, how times DO change. That's very impressive! Thanks, Dave! to do so much for sports on the Peninsula and he has not slowed down a bit. Photo to follow! I have been reading, with great interest, the articles on "The Boys Club." I have a few memories myself and I thought I would share them. You could join the club when you were six years old, which I did in 1956. 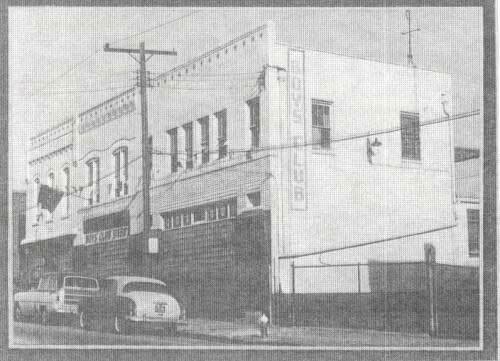 At that time they were building the new club on the corner of Jefferson Avenue and Hilton Boulevard and were using the white building next door on Hilton Boulevard until it was complete. I was a member every year until I became too old in 1968. 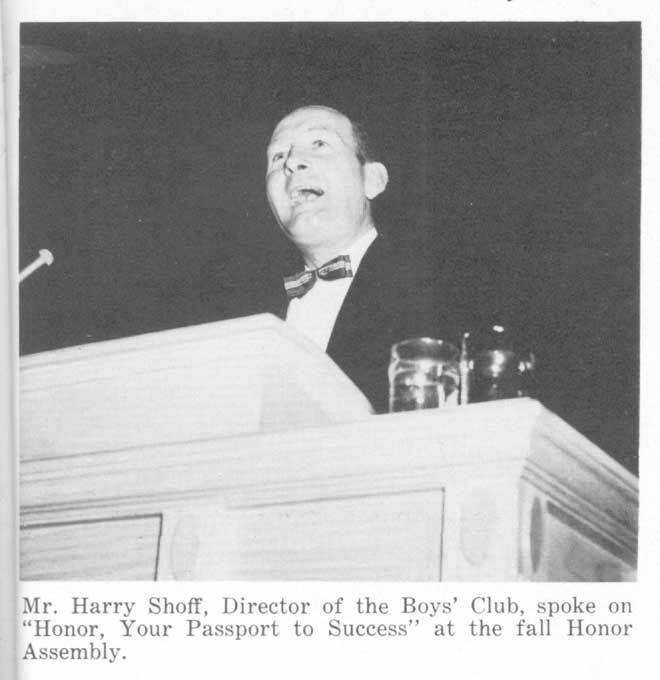 I remember Harry Shoff was the director, but he left and Thomas Olaisen, MR. TOM as we called him, took over. 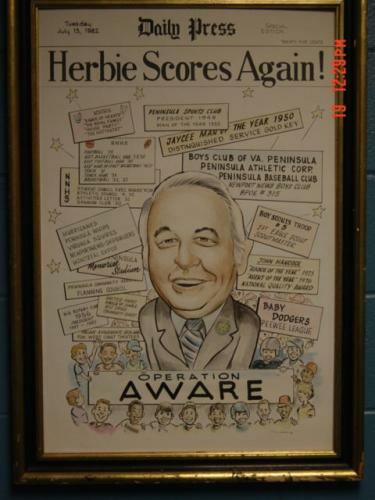 There was also a Mr. Beales who was program director in the early 1960s. What stood out about him was he drove a 1955 Chevy. It had straight shift on the column and he only had one arm. But boy, could he speed shift that thing. He could also play me a mean game of table tennis. 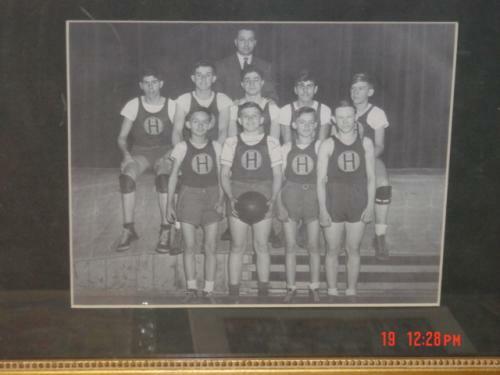 I carried The Times Herald newspaper in Briarfield Manor from 1962 until 1965 and then the Boys Club hired me to work the Craft Room for a whopping 50 cents an hour. It was my first job that required a Social Security Card. 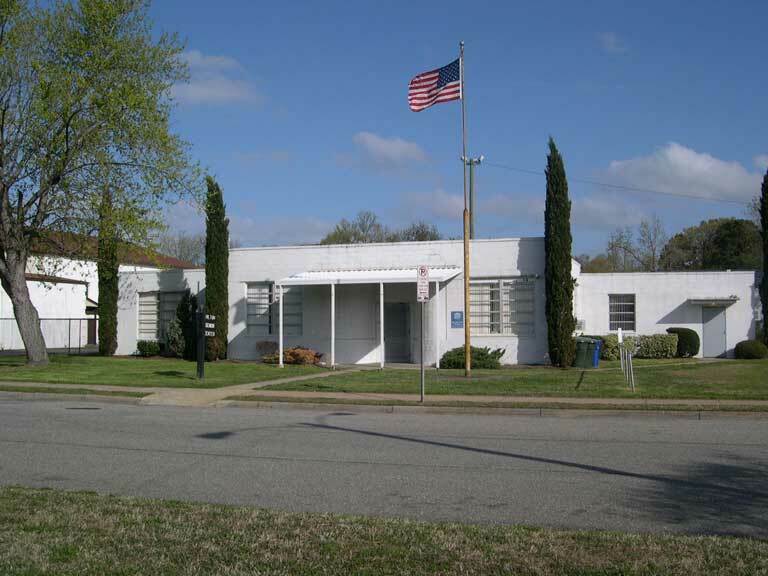 I remember going to the Social Security office on Marshall Avenue. It was on the side of the bank building, maybe First and Merchants? 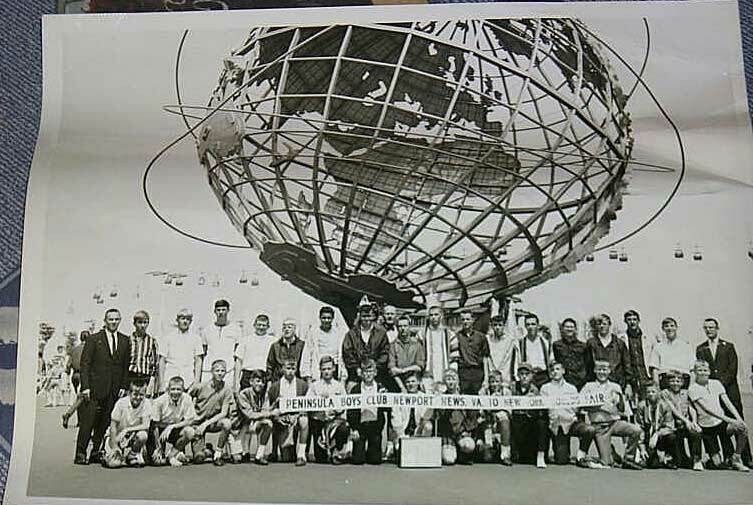 Another thing that I remember, was that in 1964 they organized several bus trips to the World's Fair in New York. My first trip to the Big City, and first away from home without Mom And Pop. It was G-R-E-A-T. I have a picture of that around here somewhere and will forward a copy when I locate it. 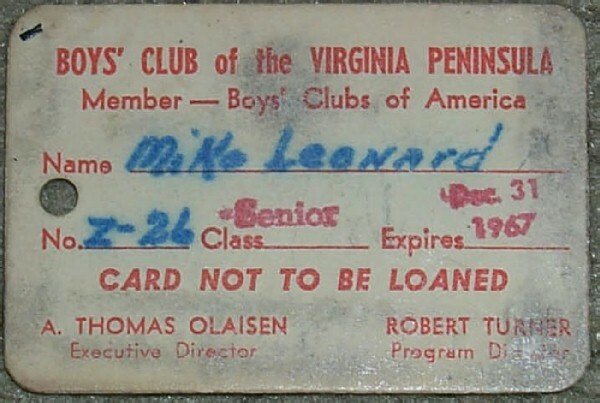 In the meantime, here's a copy of one of my old club cards. Keep up the Great Work......Until next time. On the Boys Club page, there have now been several fond remembrances of the Director, Tom Olaisen. Perhaps it is now time for some of us to tell him in person how we feel about those Halcyon Days of youth and "innocence". DOUBLE WOWZERONI!!! Thanks so much, David! What a wonderful opportunity! and #18 on the back row is Max Bartholomew - '65. The Boys Club was my home away from home. Wish I could identify more. AHA! I was right with my wild guesses! Thanks, David! 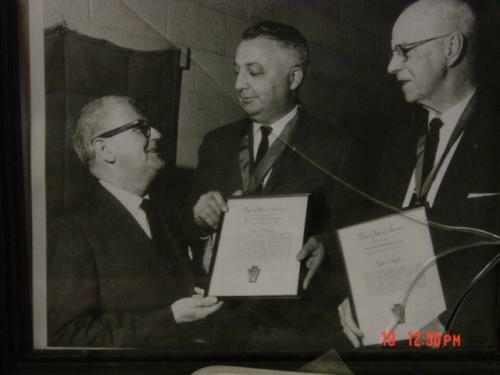 Mickey (Marcella - '54) says that the man on the right beside Herbie Morewitz is W. F. "Bill" Files. Thanks, Carol! I adjusted that caption to the image Joe Madagan sent us above. Today I received a "Snail Mail" reply to my letter to Mr. Tom Olaisen requesting that he try to identify those in the photograph. (12 Mike Mitchum, (14 Ernie Jones, (15 Dennie Perkinson. OH! Thanks for your persistence!, Joe! 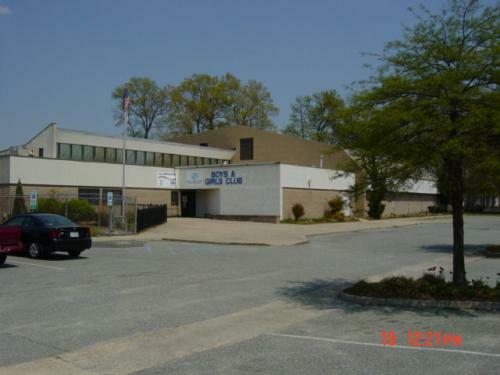 I can remember going there almost every Saturday, playing basketball and making crafts. It was a fun place to hang out. 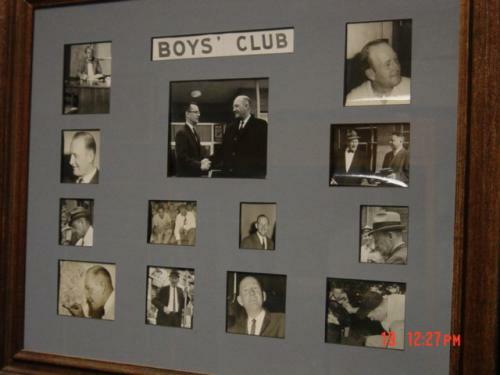 After seeing Glenn Dye's ('60) of TX, note about the Boys Club, I clicked on the link and enjoyed the photos and memories. I was there one Saturday when the late action film star Aldo Ray dropped in. He talked with everyone and gave out autographed pictures. I don’t remember the year (1955? ), just the excitement of meeting a film star. He may have been promoting a film at the Palace and came by because Harry Shoff convinced Herbie Morewitz to bring him by. To all Typhoon former Boys and Girls Club members...Don't miss your chance to meet CAL RIPKIN, JR. for an elegant evening, dinner gala and sports-themed auction to support the Boys & Girls Clubs. For tickets, information and sponsorship opportunities, go to www.bagclub.com. There are loads of opportunities, from being a sponsor, attending an elegant dinner, attending a cocktail reception prior to the dinner, reserving a table at the dinner, receiving an autographed Cal Ripken, Jr. baseball, and much more. The event will be held at the Hampton Convention Center on April 23, 2009. Check the aforementioned web site for details. Checks should be sent to the Boys and Girls Club of the Virginia Peninsula. If you are unable to attend the dinner and would like, you may make a 100% tax deductible donation to the Boys & Girls Clubs of the Virginia Peninsula. 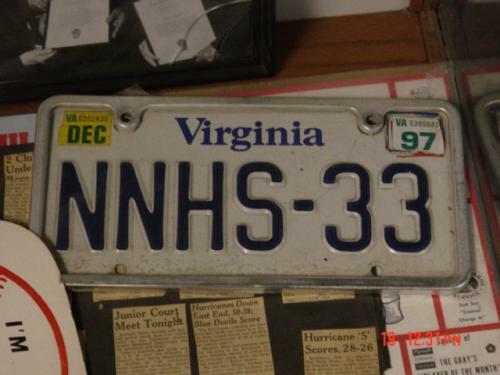 Additional information may be received by calling (757) 223-7204. This is a once in a lifetime event to raise money for the Boys & Girls Club. Don't miss the chance. If you like, you can get in touch with me personally at (757) 249-3800. Thanks so much. WOWZERONI! Thank you, too, Mickey! I appreciate your putting my note on the web about the Cal Ripken event for the Boys and Girls Club. I have been on the Boys and Girls Club board for 25 years and a charter member of 1946. This is a once-in-a-lifetime fund raiser for the Club and we appreciate your putting it on line for others to see. You've done a great and mighty work, Mickey, and the entire community and beyond is grateful! 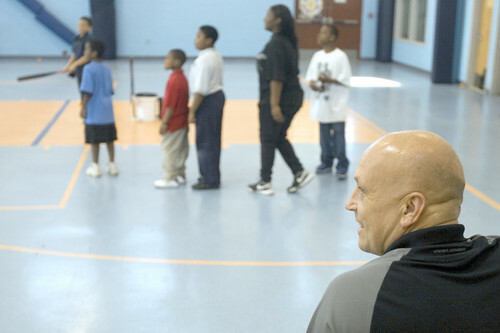 Major League Baseball Hall of Fame inductee and former Baltimore Orioles infielder Cal Ripken Jr. tours the facilities Thursday, April 23, 2009, at the Boys and Girls Club on Hampton Avenue in Newport News. 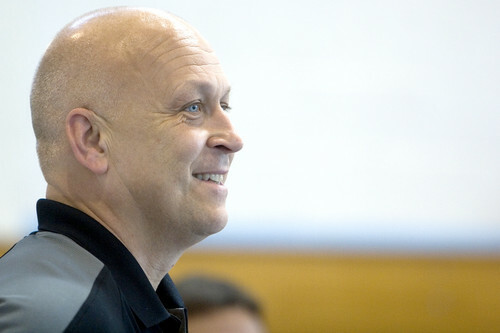 Major League Baseball Hall of Fame inductee and former Baltimore Orioles infielder Cal Ripken Jr. tours the facilities Thursday, April 23, 2009, at the Boys and Girls Club on Hampton Avenue in Newport News. 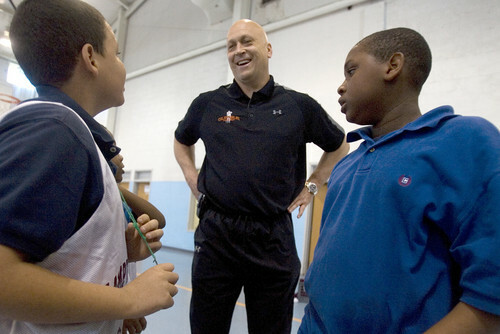 Major League Baseball Hall of Fame inductee and former Baltimore Orioles infielder Cal Ripken Jr. talks with kids Thursday, April 23, 2009, at the Boys and Girls Club on Hampton Avenue in Newport News. Major League Baseball Hall of Fame inductee and former Baltimore Orioles infielder Cal Ripken Jr. talks with some kids as they wait for a game of Ripken Quickball to get set up Thursday, April 23, 2009, at the Boys and Girls Club on Hampton Avenue in Newport News. Ripken Quickball is a game Ripken created as a product, training aid and game. 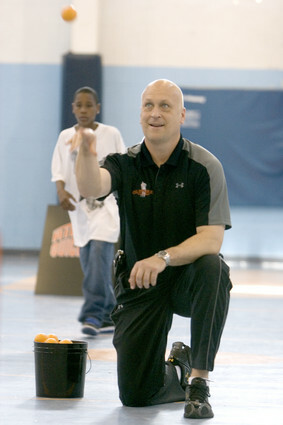 Major League Baseball Hall of Fame inductee and former Baltimore Orioles infielder Cal Ripken Jr. watches a game of Ripken Quickball on Thursday, April 23, 2009, at the Boys and Girls Club on Hampton Avenue in Newport News. 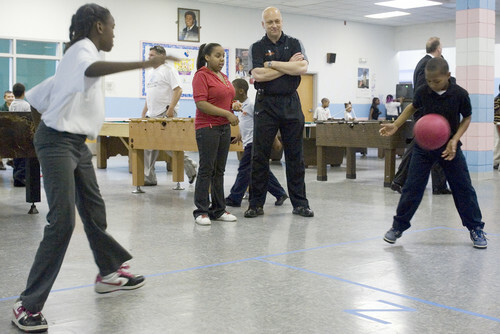 Major League Baseball Hall of Fame inductee and former Baltimore Orioles infielder Cal Ripken Jr. pitches balls for players during a game of Ripken Quickball on Thursday, April 23, 2009, at the Boys and Girls Club on Hampton Avenue in Newport News. Shynice Richardson, 12, gives Major League Baseball Hall of Fame inductee and former Baltimore Orioles infielder Cal Ripken Jr. a tour of the facilities Thursday, April 23, 2009, at the Boys and Girls Club on Hampton Avenue in Newport News. 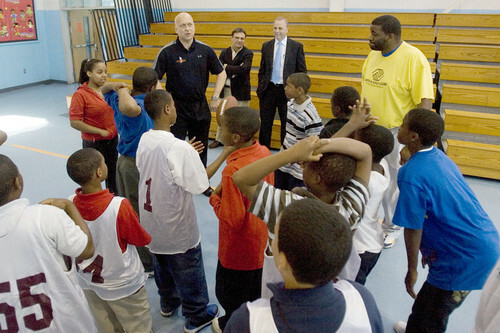 Major League Baseball Hall of Fame inductee and former Baltimore Orioles infielder Cal Ripken Jr. talks with a group of kids Thursday, April 23, 2009, at the Boys and Girls Club on Hampton Avenue in Newport News. NEWPORT NEWS - Shynice Richardson, 12-year-old sports fan and devotee of the downtown Boys & Girls Club, admitted that she was a little nervous at first, playing tour guide for Thursday afternoon's celebrity guest. But baseball Hall of Famer Cal Ripken Jr. was an eager and willing participant who wanted to hear what Richardson had to say. "It was easier once we started walking and talking," she said. "He seemed like a regular guy who was a really nice person and somebody you'd like to know." Ripken parachuted into the Peninsula for a Thursday evening fundraiser to benefit the local Boys & Girls Clubs — the Cal Ripken Sr. Foundation has been a big contributor to the organization in the past three years. The group hoped to clear some $300,000 from the event. But before attending the event at the Hampton Roads Convention Center, Ripken insisted on an unannounced stop at one of the local clubs. Such stops are routine in his regular schedule, if for no reason other than to spend time with kids. "We're not trying to grow the game of baseball, per se," Ripken said. "I think we're using baseball as a tool, essentially, to interact with the kids. Give them new experiences, kind of open up the world to them. Sports does that naturally. We just use baseball because that's what we did." Richardson squired Ripken around the facility at the corner of Jefferson and Hampton avenues. He saw the gamerooms, the gym, a tutorial classroom and a computer lab. He pitched a brief session of "Quickball" to the kids in the gym — a sort of accelerated version of wiffleball, using plastic bats and spongy balls — and for his efforts he took a screamer off his neck and one in the gut. He was having a blast. "I was showing him that our club is unique and different from other places," said Richardson, who has come to that facility since she was 6. "I think it was very cool that he would come here and see it. They call this a bad neighborhood, but this is a safe place. "I think it's very important to have places like this," she said. "You can get away from your problems and a lot of stuff on the outside for a little while. There are a lot of activities, and you can be around good people." Ripken's foundation is a tribute to his late father, Cal Sr., who used baseball as a means of teaching life lessons. The younger Ripken said that Cal Sr. had a soft spot for kids without father figures in their lives, probably because his own father passed away when he was 10. That's why he and younger brother Bill wanted to do something geared toward helping kids. "It's something we care about, it's something we're passionate about," Ripken said. "We're tickled to death that we can actually impact kids in a positive way. It's something we plan to do for a long time. We're not in it for the short term." Nothing in Ripken's life or baseball career is about the short term. He is best known for playing in a Major League record 2,632 consecutive games, from May 30, 1982, to Sept. 20, 1998. He amassed 3,184 hits and was a 19-time all-star, playing his entire career for the Baltimore Orioles. A first-ballot Hall of Famer in 2007, Ripken now devotes the same diligence to his current pursuit, which he said has succeeded and expanded beyond even his initial aims. "It's kind of fun to think of the possibilities," he said. "Maybe in some ways we can be the glue that brings people together and makes communities better. It's not a big, huge mission, but it's something we're passionate about." • Best known for playing record 2,632 consecutive games, from May 30, 1982, to Sept. 20, 1998. • Was a 19-time all-star. of Joe Madagan ('57) of FL and Mickey Marcella ('54) of VA.